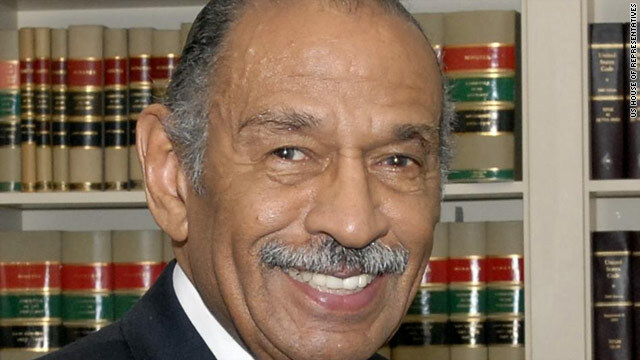 U.S. Rep. John Conyers, D-Michigan. criticized President Obama on several issues Monday, including foreign policy. Veteran congressman wants to "make him a better president"
Washington (CNN) -- Senior Democrat John Conyers of Michigan criticized Barack Obama Monday, hoping, Conyers said, to "make him a better president." Citing the troubled job market, rising energy costs, and turmoil in the Middle East, Conyers told reporters at the National Press Club: "We keep getting a longer and longer list of things he wanted to do, wished he could do more about, and is of course having a big problem." "The only thing that saves him, of course, is that there doesn't seem to be anybody to run against him next year," Conyers said. After naming prospective challengers Sarah Palin and Newt Gingrich, among others, Conyers said he still supports Obama because "the alternative is unthinkable. I just want to make him a better president." Conyers said, "It is kind of amazing to me that there is still adopted, even in this administration, the attitude that military prowess will settle things down. And they rarely, if ever, do." He also responded to a question about the recent departure of a ranking State Department official who was critical of how the Pentagon is reportedly treating U.S. Army Pvt. Bradley Manning, a soldier suspected of a role in the WikiLeaks scandal. "I was not in agreement again with the president saying that he's told Manning's been treated -- his confinement is okay, that he's told everything is alright. I don't think it's all right." State Department spokesman P.J. Crowley resigned in recent days after remarks indicating he agreed with criticism over Manning's conditions of confinement. Conyers Monday suggested Crowley's concerns might have a basis. "They may well be accurate, and probably are, but I think he was prepared for what happened."